For someone who isn't that into Halloween, I'm sure getting into decorating for it. Or at least baking for it. And let's be honest, I can get behind baking for just about anything. These cupcakes weren't for me though; I made them for the Annual Fall Bazaar at the Banfield Pavillion at Vancouver General Hospital, home to 200 adults who need life-long medical care. I hope they were a hit with all who attended! 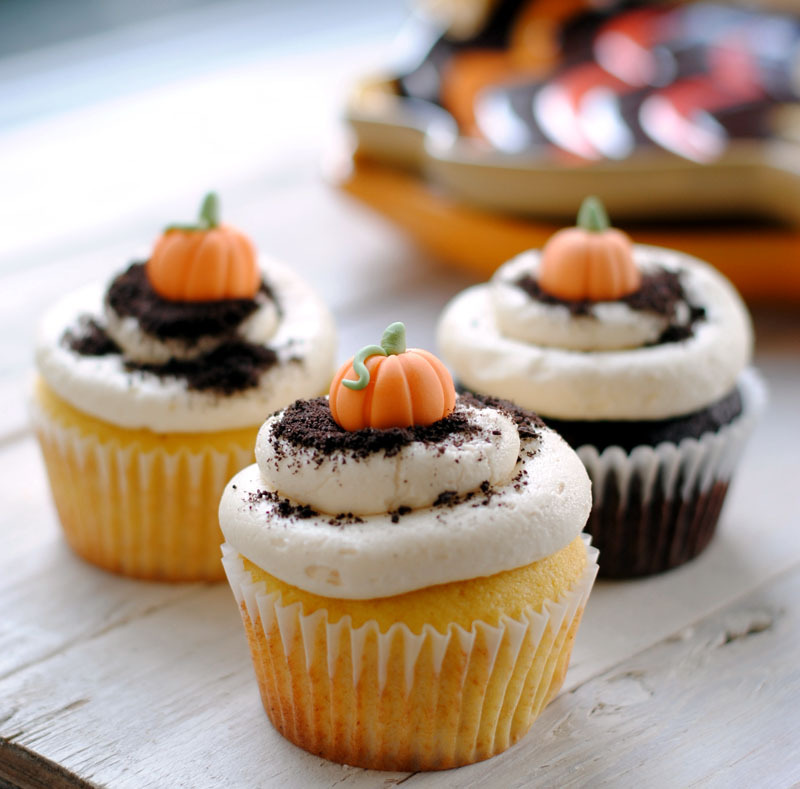 Want to learn how to make these little gumpaste pumpkins? It's way easier than it looks (unless you think it looks easy, then it's exactly how easy you think it is). Dye some gumpaste orange and some more gumpaste green. Roll a small amount of the orange gumpaste into a ball, squishing it slightly so it gets a pumpkin shape. Using the dull side of a knife, or the edge of a skewer, indent lines into the sides so they meet at the top. It will look a little like a basketball; this is fine. Indent a small (3-5 mm) dent into the top of the pumpkin -- this is where the stem will sit. Take a very small bit of green gumpaste and roll it into a cone. Wet the indent of the pumpkin with water, gumpaste glue, or egg white, and stick in the stem. You can create a little vine, too, if you're feeling fancy. See? Not so scary! Go give it a try.